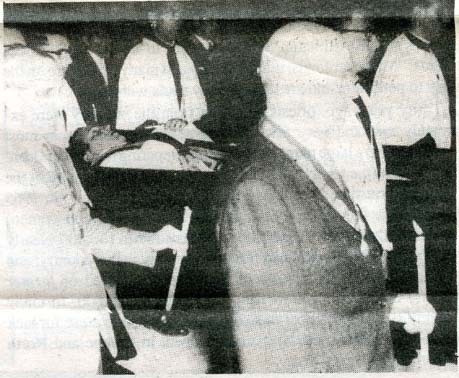 Father Luis died during an act of love. I never thought God would grant me so many graces with such a holy son. The only other person to see Our Blessed Mother at Garabandal was a 38-year old Spanish Jesuit Priest, Father Luis Marie Andreu. On August 8, 1961, Father Luis was among the spectators at "The Pines" when suddenly he became an integral part of the Garbandal drama, he was heard to say, "Miracle! Miracle! Miracle! Miracle!" Not only did he see The Virgin Mary, but he was shown the forthcoming "Great Miracle." 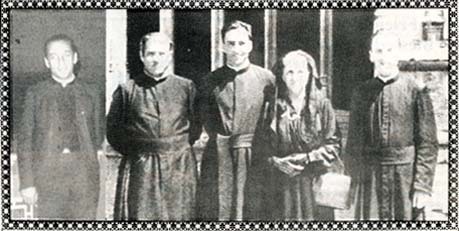 From left to right - Father Marcelino, Father Alejandro, Father Ramon and Father Luis with their mother who became Sister Luisa Maria. The four 11 and 12 year old children, Conchita, Loli, Jacinta and Mari-Cruz were already in ecstasy. They understood Our Lady to say to him: "You will soon be with me." Although, he had never had any history of serious illness, he died that same night of complete joy. His final words were: "Oh what a sweet and lovely mother we have in heaven ... how happy I am ... what a favor The Blessed Virgin has bestowed on me. How fortunate we are to have a mother like her in heaven! There is no reason to fear the supernatural life. The girls have given us an example of how we must act with the Blessed Virgin. There is no doubt in my mind that the things involving the girls are true. Why should the Blessed Virgin have chosen us? This is the happiest day of my life." With those words, Father bowed his head and died. Our Lady has said, "That on the day AFTER the 'Miracle' his body will be found to be incorrupt"
Father Luis who died of joy. Father Luis was born on July 3, 1923. Of his five brothers, three became Jesuits. Father Alejandro, the oldest was based in Caracas, Venezuela until he died on August 8,1990, with the date of his death and that of Father Luis mysteriously coinciding except for the year. Father Ramon, a very important eye-witness to several hundred ecstasies of the Garabandal seers, and who documented what he saw and heard along with his impressions, has been stationed in Los Angeles, California. The youngest brother, Father Marcelino, has been in Taiwan for many years and although he is seriously ill with a rare form of Lukemia, his condition remains stable. On July 18, 1965, during a Mass celebrated at Garabandal by Fr. Marcelino, Conchita had a locution in which the Virgin said that Fr. Marcelino Andreu of China will be in Garabandal on the day of the great Miracle. In another locution, Conchita learned that Fr. Alejendro of South America will also be in the village for the Miracle. Shortly after the death of Father Luis, his mother entered the cloister of The Salesian Order, at the Visitation Convent in San Sebastian, Spain. Finally realizing her life-long desire at age 65, she became Sister Luisa Maria, taking the name of her son Luis. During a tape-recorded interview, on October 21, 1990, I felt indeed so privileged to be able to chat with her and her Mother Superior, Sister Maria Elena. The following month on November 28,1990, looking much younger than her 94 years, still alert and agile, she peacefully passed away. She had anticipated her eternal meeting with Christ whom she had seen and conversed with many times over the years even prior to her entrance into the convent. While during her lifetime she wrote books dealing with contemplation, we cannot help but be inspired by the penetrating thoughts she had penned. "My God, soon I think I will find myself with you. I see that You are already taking me to Yourself. How will our meeting be my Love? I hope that it will be of love for the love I feel for You. I want my soul to be empty so that Your love can fill it. And being with You, nothing makes me tremble. I desire to see You, to contemplate You. I see that You are looking at me and I am smiling before Your look that so earnestly longs for my heart. I would like to offer You a world of loves, but seeing myself so small for so much that I want to give You, I will give You the poor lowliness of my heart. I want to be a volcano of loves and to pass its lava through me erasing that which You don't like so that I am able to give You my pure love, being only for You." The following is only a small edited version of my 1-hour conversation with Sister Luisa where she describes the vision of Father Luis after his death along with the two unidentified Jesuits whose faces she did not see. If I were to speculate, which I rarely ever do in public, I would venture to say that they were her other two sons from whom the above prophecies concern, that is Fathers Alejandro and Marcelino. They were both alive at the time of the vision. And furthermore, can we not say that Jesus by calling Father Alejandro to heaven, on precisely the 29th anniversary of his brother's death is giving us an assuring message loud and clear that nothing happens by coincidence that all these events and prophecies have a definite part in God's Divine Plan as the passing of time will surely authenticate? We cannot help but recall His Words, "Do not be concerned whether they believe you or not I WILL DO ALL." 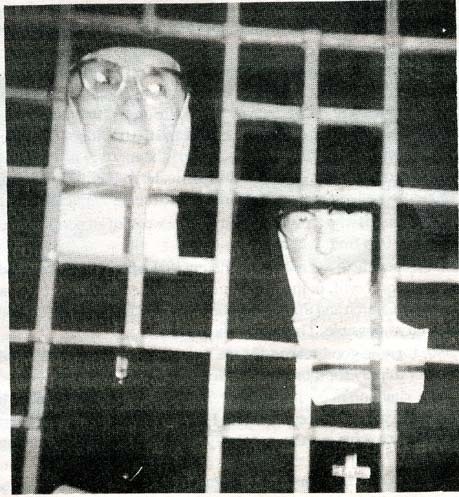 Sister Luisa Maria with her Mother Superior Maria Elena on her right. One night as I was preparing for bed in my convent room, I heard a voice say: "Father Luis is coming." The lights went out but I should say the lights turned on and then Luis appeared. I saw him just like I'm seeing you. I don't know if he was flesh or what, since I did not touch him. I cannot explain it. He didn't speak. I was so dumbfounded. I should have asked him 'where are you, what are you doing?' He looked at me smiling, he looked very good, calm, trim, very well groomed like a person that was very satisfied and after he was there for awhile, smiling and laughing, he stretched out his hand touching the doorknob, and without moving he disappeared. There were two persons with him but I only saw their backs. They were dressed like Jesuits. They had the cassocks of the priest. Father Luis was laughing. I could see his white teeth just like I can see yours. The priests were in the same room but separated away from him. I could only see the back of them, but Father Luis was facing me. "Were they taller or shorter than Father Luis? "They were about the same height. "Do you have any idea who they could be?" No, I didn't see their faces. They were just having a private conversation between themselves without being concerned with what was going on. "Have you seen Father Luis any other time since then." No, but even though it has been more than 25 years, I recall it as though I have just seen him. "Do you know the exact date that Father Alejandro died? Yes, he died on the 8th of August (1990 in Caracas, Venezuela). It was the very same month, date, and hour as when Father Luis died (August 9,1961 in Spain). "But Father Luis died on August 9 not the 8th." When calculating the time difference it comes out to the 8th of August. Father Alejandro had as a souvenir the wrist watch that belonged to Father Luis and he was wearing it when he died. "Someday Father Luis will be made a saint." Yes, of course but their have to be some miracles before his beatification. What does the church think about it? "He is a saint." He died during an act of love. I never thought that God would grant me so many graces with such a holy son. "And the reason for that is because he has such a holy mother." 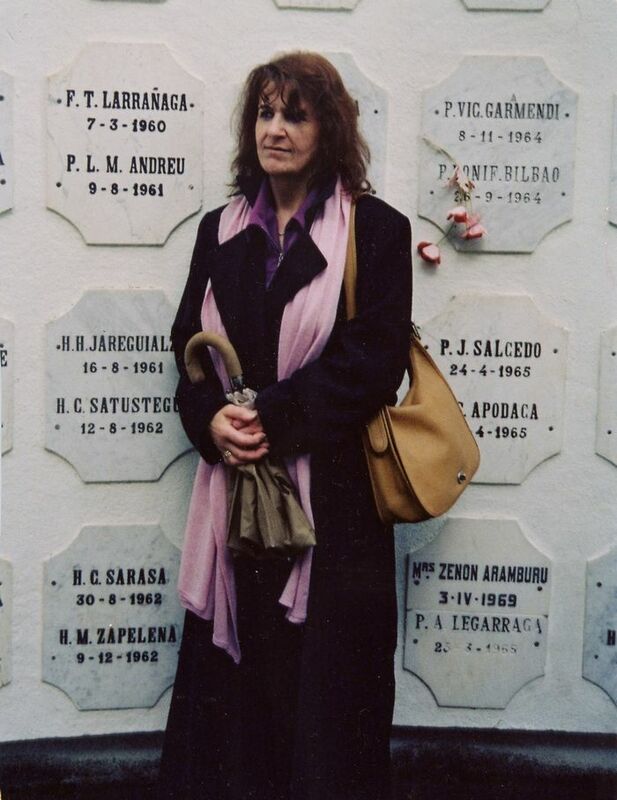 Mari-Loli looks at the crypt of Father Luis Marie Andreu, he died August 9, 1961.